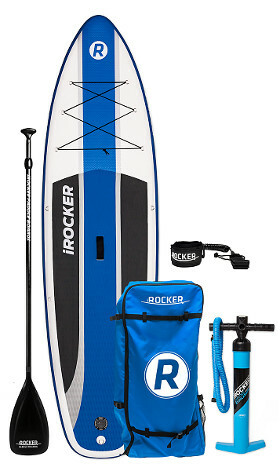 “Not all paddle boards are created equal”, this is how iRocker likes to state that their iSUPs are the real deal when it comes to quality and durability. 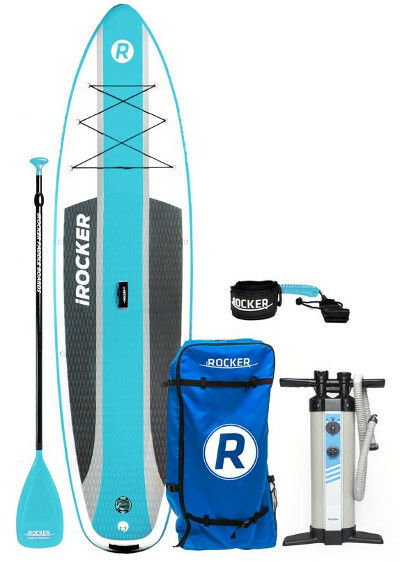 iRocker have been known for their great interest in all that is related to water-sports, and that’s how they came to the realization that stand up paddle boards are the greatest and most useful piece of creation to add up to the life of water enthusiasts. Thus, having reviewed so many different iSUPs brands myself, I can easily agree that the people behind iRocker are not wasting any time, and to demonstrate what we’re talking about, the Cruiser is going to be under the spotlight for anyone who is interested in a strong and rigid iSUP. A good iSUP is a versatile one that suits different people with different needs and skill levels in different water conditions. The Cruiser comes in what I like to call the perfect size; a size that is convenient for almost everyone especially beginners. 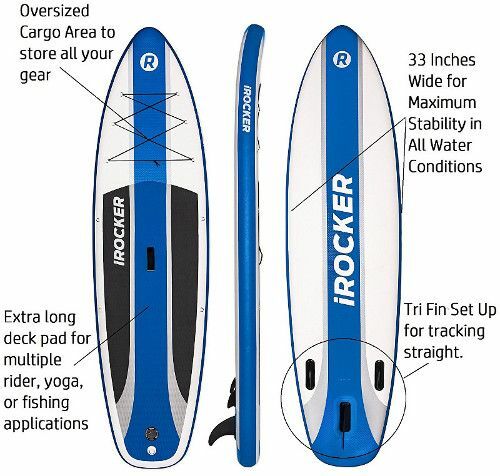 This board is 10.6 feet long, 33 inches wide and 6 inches thick and it’s specifically made to maintain a great deal of balance on flat water given the fact that it’s 33 inches wide. Most boards are barely 30 inches wide and that’s not bad, however, the extra 3 inches make a whole lot of difference once you put the board in the water. 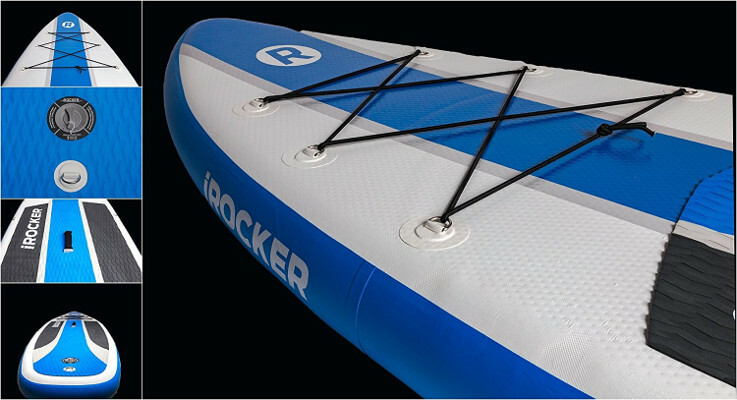 The 10.6 feet make the Cruiser a great board for long distance paddling, recreational paddling and yoga. You can even try to surf on this one and it won’t be disappointing because you’ll get to comfortably control it since it’s built to be highly responsive to your body for the best manoeuvrability possible in different water conditions. Basically, a good iSUP is a versatile one that suits different people with different needs and skill levels in different water conditions. Coming down to thickness, it’s one of the best things about iSUPs. It’s rare to find a board that is thicker than 6 inches unless it’s a monster iSUP that is made for a family to cross the ocean on it; just kidding, however, you should know that you are getting the good stuff on the market if your board is 6 inches thick; you’ll float like a leaf with no water getting onto the board. Inflatable stand up paddle boards did not establish such a reputation out of nothing; iSUPs have made their way to the top of water sports industry announcing that quality and durability come in different shapes; and this time it’s inflated. iRocker knows that they can’t compromise quality or performance to produce something that is practical and easy to use, that’s how a great board like the Cruiser came to life. This board is made of a triple layer military grade drop stitch that is known for its extreme rigidity and durability; once the board is fully inflated you’ll feel how similar it is to an authentic one. I’m definitely not trying to compare the two, but that’s how good construction is. The parts of the board are stitched very carefully to make it feel like one piece, and you can definitely feel that once you’re on the board in the water. The PVC material combined with the EVA pad make it nearly impossible to bend the board even when it reaches its maximum weight capacity; 350 LBS. The company presents you a 2 years warranty if their iSUP failed to fulfill what’s expected; that’s another way to say that iRocker trust their crafts and know what they’re doing. An EVA foam traction pad which is a necessity on any board; it adds to the thickness and rigidity of the board as a whole, as it does the main job required which is to keep you standing on the board even when it’s wet. 6 stainless steel D-rings on the front of the board, and they are connected a large strong bungee cord. This feature comes really handy for anyone who needs to take any kind of storage with him/her on board. Another 4 D-rings are on both sides for anyone who’d like to use a kayak seat, with an 11th D-ring on the tail of the board to attach a safety leash. You’ll also find a carry handle which the least I can say about is that it’s rigid, firm and supportive. Using this one handle, you can carry the inflated board easily, or use it to get on the board’s back while in the water. The tracking system on this one is simply perfect, it consists of 3 fins; one is large and removable while the other 2 are smaller and fixed. They add up greatly to the board’s performance in flat water; you’ll be able to sense the difference if you tried using the iSUP without the large fin; it’ll feel way smoother once attached. Basically, this package will leave you nothing to worry about because it includes everything you could possibly need to handle an iSUP. The Cruiser’s strength is its balance; this board is a very sturdy one. It’s guaranteed to make standing on water an easy thing even for beginners. This board performs better in flat water; it’s swift, easy to control and very responsive. I cried the Cruiser in somewhat choppy water, and I was pleased with how it went; it wasn’t too fast and that’s, however, is not the purpose behind this board. My friend suggest I use it for yoga, but I’m honestly not a yoga person, yet, it’s really worth the shot for anyone who’s into yoga; the Cruiser is a balance monster with that 33 inches. The Cruiser comes in an all-inclusive package (it literally includes everything). It’s convenient for all riders with different needs and skill levels. It’s extremely rigid and strong (nearly indestructible). It’s one of the most stable iSUPs out there (33 inches wide). It won’t bend no matter how hard you try (6 inches thick). It comes with a trio-fin system which is the best you can get. You’ll have 2 years warranty. I would have to squeeze my brains so bad to find one right now; however, I’ll make sure to make an update if anything happened.